Meet my 2 year old son (who loves to have his picture taken!) I think this could be the last time I pick out what he will be for Halloween. My husband and I have been watching Star Trek on Netflix and I knew I could make the uniforms myself!!! 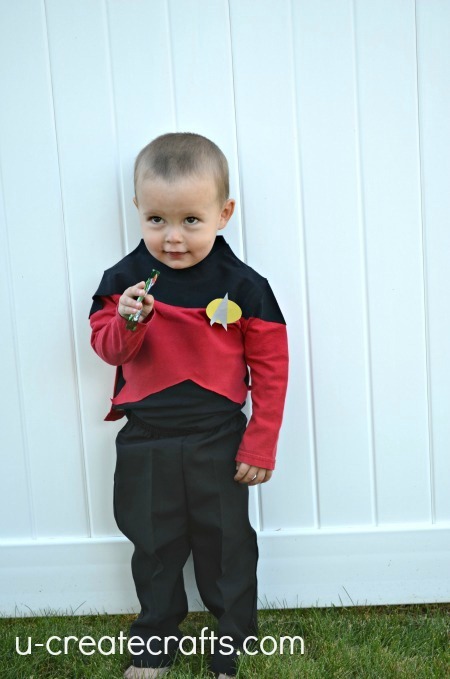 He is my little Jean- Luc Picard of the USS Enterprise!!! Take newspaper and cut it out to look like the front of the uniforms. This way if you make a mistake you can toss it and get another one. The front cut looks like two small triangles. The back side is cut at an angle. I also cut out the sides under the armpit. Avoid the sleeve. Next sew a tube out of the black knit. 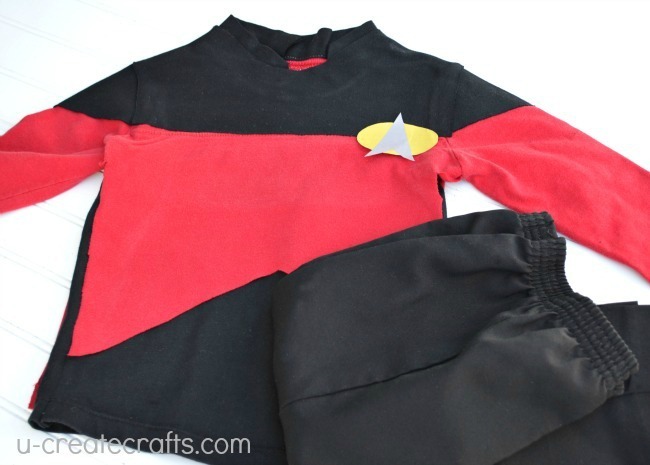 The measurements for the tube as are wide across as the red shirt and 3-4 inches longer than the red shirt. I did not have to worry about the hem line on the black tube because I used an old maternity shirt that already had a nicely sewn bottom! ( I cheat when it comes to sewing costumes!) 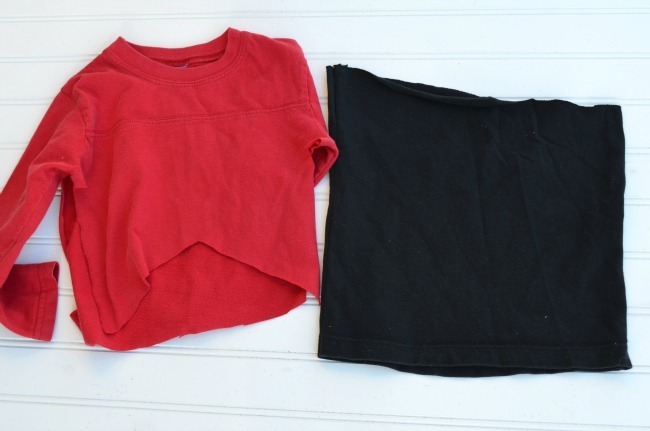 Place the black tube inside the red shirt. 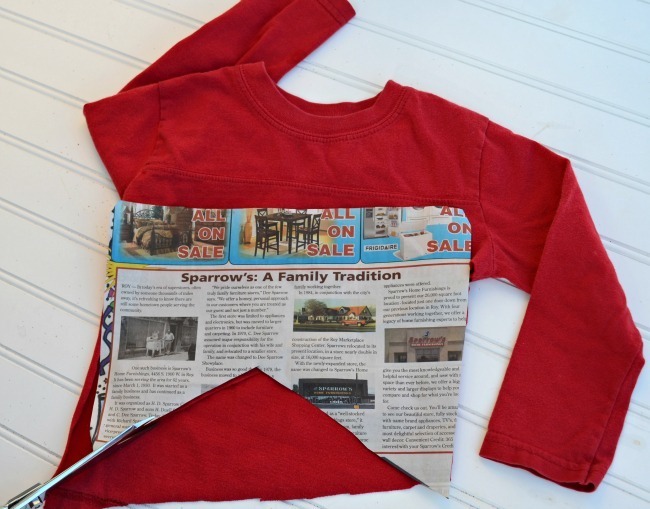 turn inside out and sew the black tube onto the red shirt around the armpits. 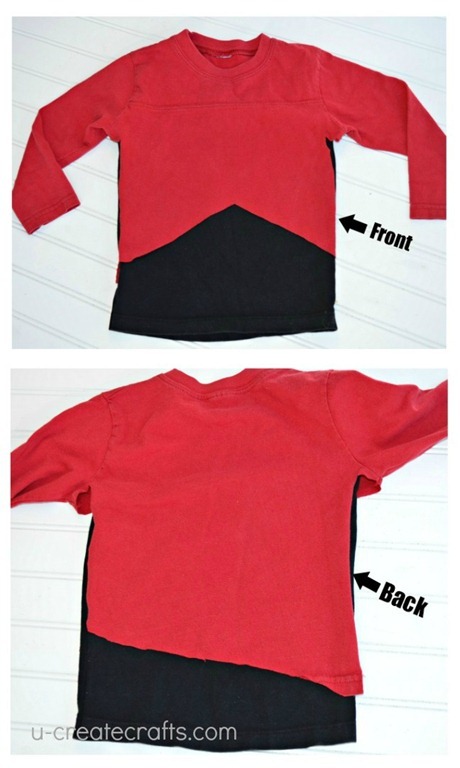 Next grab your Heat and Bond ( or wonder under) and iron on the red shirt onto the black tube. I use the strong kind so I don’t have to do a top stich. Your almost done. The last part is figuring out the top of the uniform. The easiest thing to do is place the Head and Bond on top of the shirt and with a pencil draw on the top of your shirt. You need the black material go from shoulder to shoulder and cover the collar and the top of the shoulders. I also put black triangles on the sleeves. I added a higher black collar to my shirt. I just measured the rim of the neck and sewed on the collar. The order I iron everything on: arms, front, and back. I did find that the Heat and Bond did make the shirt less stretchy (okay I couldn’t fit my son’s head through the opening.) I cut a slit in the back down to the red, to make it easier to pull on. You can use a hook and eye to close the slit. Plot a course to the best trick or treating houses. Engage! He looks so adorable in this! His facial expressions always crack me up…funniest kid ever. We are big star trek fans here. Our favorite is Captain Archer. You have made it so well and made it look easy enough that I think I will give it a shot. I think my little girl would be really happy. Oh my heck, I love those pictures. He looks awesome! You just warmed my Trekkie heart!